← Perfect weather for a run! Anyway, I’ve been heads down working on holiday gifts… pretty much everyone is getting handmade stuff this year. I’m really only buying a few items here & there for the kids, my boys and my nieces. Every spare moment I’ve had has been either knitting or crocheting on a project – too many to have listed here!! Besides, I don’t want to post everyone’s gifts, just in case the fam actually remembers my blog & reads it. ROFL! 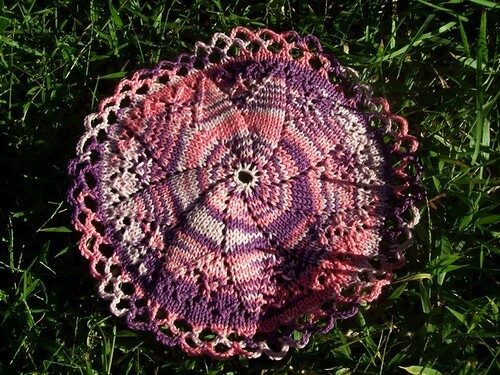 But… here is a shot of the first doily I’ve ever knit! This morning, I knocked out a Tae Bo workout with some added pushups. It’s time to reclaim my fitness!! Logged into Spark People for the first time in almost a year today, too. I am determined. It’s been one of the most stressful years, way too much work and personal events to focus on MY health. Time to get back to my usual self, though. This entry was posted in Running and tagged Knitting, Running, Spark People. Bookmark the permalink.